Diabetic Macular Edema: Evidence based treatment approach. Effect of Photodynamic Therapy on Choroidal Vascular Index in Central Serous Chorioretinopathy. Comparison of Effectiveness of Intravitreal Ranibizumab and Dexametazon in Branch Retinal Vein Occlusion. Effect of Afl ibercept on Human Corneal Endothelial Cells in Neovascular Age-Related Macular Degeneration: A Pilot Study. Effi cacy of Dexamethasone Implant versus Intravitreal Ranibizumab Treatment for Chronic Diabetic Macular Edema in Type 2 Diabetic Patients. 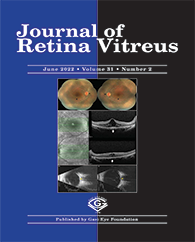 Results of Topical Brinzolamide Treatment in Patients Diagnosed X-linked Retinischisis. Correlation between Optical Coherence Tomography and Multifocal Electroretinogram Findings in Patients with Central Serous Chorioretinopathy. Long-Term Effi cacy of Intravitreal Bevacizumab Monotherapy in Aggressive Posterior Premature Retinopathy. Clinical Features of Endogenous Endophthalmitis. A Simple and Effi cient Option for Rhegmatogenous Retinal Detachment: Pneumatic Retinopexy. Comparison of Effi cacy of Three Different Anti-Vascular Endothelial Growth Factor Agents in Treatment of Macular Edema Secondary to Branch Retinal vein Occlusion. Analysis of Response to Afl ibercept in Diabetic Macular Edema Refractory to Previous Ranibizumab Theraphy. The Results of Afl ibercept Treatment in Patients With Naive Diabetic Macular Edema: A Real World Study. Bilateral Cystoid Macular Edema in A Patient Treated With Capecitabine. Impending Central Retinal Vein Occlusion and Cilioretinal Artery Occlusion in a Pediatric Case with MTHFR A1298C Heterozygous Polymorphism and ANA Positivity. Recurrent Opening of a Spontaneously Closed Macular Hole After Retinal Detachment Surgery. Optical Coherence Tomography Findings of Whiplash Maculopathy. Is There Aggravating Effect of Hyperbaric Oxygen Therapy on Diabetic Retinopathy and Macular Edema?. Failure of Intravitreal Dexamethasone Implant Application.